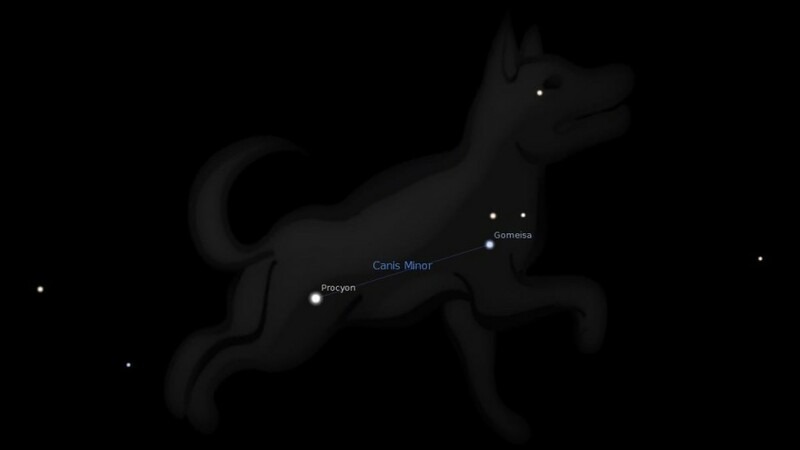 Constellation Canis Minor the Lesser Dog, is a southern constellation sitting below constellation Gemini, between constellation Orion and constellation Hydra. It spans only 6 degrees of the Zodiac in the Sign of Cancer, and contains 2 named fixed stars. Canis Minor represents Maera, the hound of Icarius, who drowned himself on account of his grief at the death of his master (see Bootes). According to another account it was Helen’s dog who was lost in the Euripus. Canis Minor, the Lesser Dog… was not known to the Greeks by any comparative title, but was always Prokuon (pro, before + -kuon, dog), as rising before his companion Dog (Sirius, Canis Major), which Latin classic writers transliterated Procyon, and those of late Middle Ages as Prochion and Procion… With mythologists it was Actaeon’s dog, or one of Diana’s, or the Egyptian Anubis; but popularly Orion’s 2nd Hound, often called Canis Orients, and thus confounded as in other ways with the Sirian asterism. 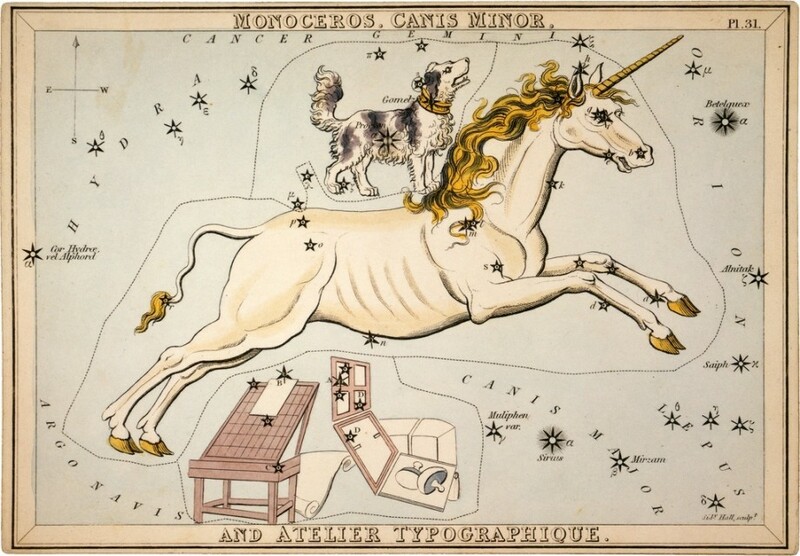 In Canis Minor lay a part of Al Dhira’ al Asad al Makbudah, the Contracted Fore Arm, or Paw, of the early Lion; the other, the Extended Paw, running up into the heads of Gemini. Like its greater neighbor, Procyon foretold wealth and renown, and in all astrology has been much regarded… Canis Minor lies to the southeast from the feet of Gemini, its western border over the edge of the Milky Way, and is separated by Monoceros from Canis Major and Argo… In astrology, like its constellation, it portended wealth, fame, and good fortune. culminates on the 24th of February. The same facts are to be remembered concerning the Greek picture, and Latin name of this constellation. The Egyptian name in the Denderah Zodiac is Sebak, which means conquering, victorious. It is represented as a human figure with a hawk’s head and the appendage of a tail. This small constellation has only 14 stars according to the Britannic catalogue. One of the 1st magnitude, one of the 2nd, one of the 4th, etc. The brightest star, α (in the body), is named Procyon, which means REDEEMER, and it tells us that this glorious Prince is none other than the one who was slain. Just as this chapter begins with two persons in one in the Sign (GEMINI), one victorious, the other wounded; so it ends with a representation of two princes, one of whom is seen triumphant and the other as the Redeemer. This is confirmed by the next star, β (in the neck), which is named Al Gomeisa (Arabic), the burthened, loaded, bearing for others. The names of the other stars still further confirm the great truth; viz., Al Shira or Al Shemeliya (Arabic), the prince or chief of the left hand, answering to the star in Sirius. One right, the other left, as the two united youths are placed. Al Mirzam, the prince or ruler; and Al Gomeyra, who completes or perfects. 1. Fixed Stars and Constellations in Astrology, Vivian E. Robson, 1923, p.35. 2. Star Names: Their Lore and Meaning, Richard H. Allen, 1889, p.131-134. 4. The Witness of the Stars, E. W. Bullinger, 34. Canis Minor (the Second Dog).